Standout wines included the ‘o6 Estate Chardonnay – clean and edgy with understated oak – at a blind tasting I would have picked this one as French. The ’06 Reserve Chardonnay was rich and full-flavoured with superbly integrated oak and lengthy acidity. And the three pinots – the ’01, the ’02 and the ’06, were surprisingly youthful, showing generous fruit and none of the tawny colour or age development often associated with older Australian pinot noir. The 2006 Reserve Shiraz showed highly-perfumed raspberry-like fragrance. Medium-bodied, it displayed vibrant summer berries on the palate, combined with light, elegant tannins. As usual, I had requested an alternative, meat-free menu and Urbane chef Kym Machin came up with the goods. The Japanese inspired ‘Two kinds of tofu’ (pictured at top) came served, picturesquely, on a black slate. 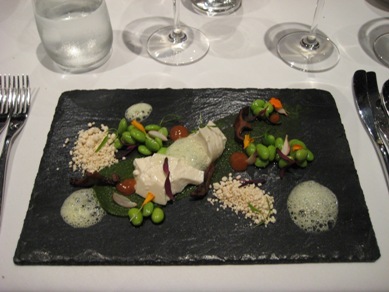 Both tofus, one almond and one soy, slid silkily along the tongue and were presented on a smear of shallot puree, along with edamame beans, crunchy sesame ‘pebbles’, and froths of jalapeno and apple ‘air’. A smoked La Luna goat cheese on a little round of brioche was served in its own cloud of hickory/rosemary/juniper berry/thyme smoke captured under a glass dome. Then there was the confit organic duck egg (pictured). The soft, unctuously textured egg sat in a smooth potato and leek veloute, the whole decorated with shavings of fresh black truffle. I knew the wine would be classy but didn’t know what to expect from the much talked about Urbane. This grumpy old critic was impressed. Urbane Restaurant, 181 Mary St. Brisbane, Queensland. Phone: (07) 3229 2271. 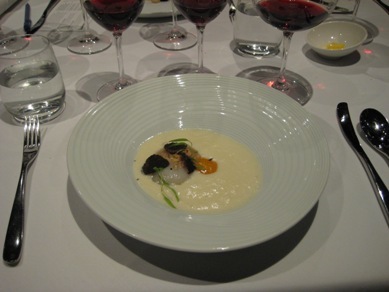 This entry was posted on 17 March 2010 at 03:32 and is filed under Food and Wine, Restaurant Reviews. You can follow any responses to this entry through the feed: RSS 2.0. You can leave a response, or trackback from your own site.